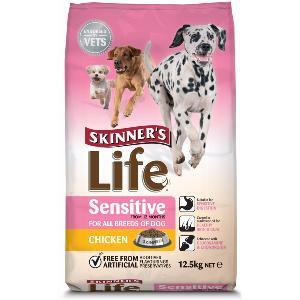 Skinners Life Sensitive Chicken is a hypoallergenic food suitable for adult dogs with sensitivities or allergies. Skinner’s Life Sensitive Chicken is free from wheat, maize, barley, soya and dairy products. It contains enhanced levels of glucosamine and chondroitin to help protect the joints of your dog and our unique herb blend containing herbs known for their beneficial properties.